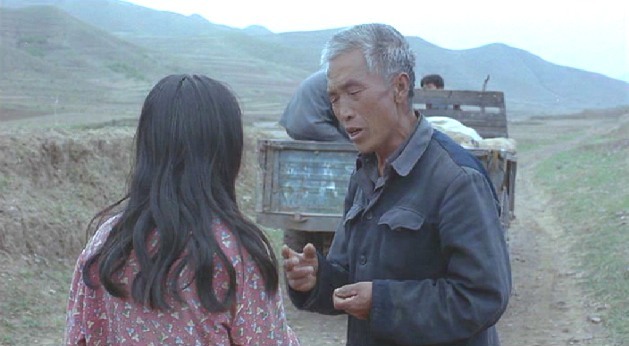 Zhang Yinou has made quite a biting social commentary on the education system in rural areas of China. The film is pigeon-holed as "neo-realistic" as the majority of the major characters are played by non-professional actors. Wei Minzhi ( played also by Wei Minzhi ) is a thirteen year old farm girl who becomes the substitute teacher for a month in a small village when the regular teacher must go away to visit his ill mother. Even initially, she displays a strong standing-up-for-herself attitude as she points out a missing piece of chalk (one for each day she is teaching) left for her to use. She also demands the Mayor (played by Zhenda Tian) to acknowledge her payment of 50 Yuan for the month of her teaching. Wei Minzhi's strong will foreshadow further events where she displays her aggressive attitude with endearing underlying innocence. As she chases down both the Mayor and departing teacher, Mr. Gao (played by Enman Gao), she is promised an extra 10 Yuan payment if all of the students remain in school when he returns. All of them. Not one less. She slowly evolves as a teacher and disciplinarian to one especially unruly child (known as the King of troublemakers) Zhang Huike. He becomes responsible for ruining the chalk that was left as well as upsetting a young girl by reading her diary and making her cry. One day he is gone. Wei Minzhi finds out from his Mother that he has gone to the city to look for work to help pay the family’s debts. She becomes determined to find and return him. Incorporating mathematical teaching into her instruction, she utilizes how much money to obtain to pay for her bus fare into the city. The children take a day and help moves bricks at a local quarry to raise the funds. One of the scenes shocking the viewer into the realistic depths of the level of poverty is how they are able to spend the extra cash they have earned that day. The children are thirsty and they all decide to buy “soda”. They have enough for 2 Coca-Cola’s that they share, many of the children tasting it for the first time. Determined, Wei Minzhi actually walks into the city to find Zhang Huike. We see that he has been scrounging on the streets for food and although Wei looks hard, inquiring everywhere she goes, their paths do not cross. She buys some paper and a pen with what is left of her money and writes out a number of signs at the train station in hopes of getting in contact with him. Her efforts prove fruitless but she continues by pestering the local television station in hopes that they can give her the help she requires. After a day and a half of virtually camping out in front of the TV station offices, eating leftover food and drinking from a public tap, a decent station manager takes her story as a good human-interest level feature and puts her on “In China Today”, a news program. It proves to reunite her with her student Zhang Huike. It is picked up by the media and the their return home makes for further news. Money is raised and Zhang Huike family debts are paid and he is able to return to school. His own struggle is seen as the microcosm of the education system in Rural China. Her intestinal fortitude proves there is a solution. The DVD is very good with a fine clear Wide Screen anamorphically-enhanced picture including removable subtitles and Chapter selections. I noticed a very slight line through the image of a few of the scenes (probably a scratch on the negative) but I still give it a very strong purchase recommendation.